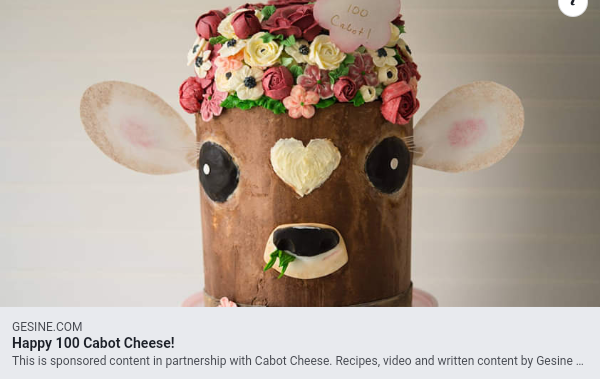 Today, the ever-creative Gesine Bullock-Prado posted a special cake for Cabot Creamery’s 100th anniversary, on Facebook. You might expect a cheesecake for such a commemoration, but Gesine is too inventive for something so predictable. She produced a charming bust of a dairy cow, beneath whose buttercream-flower-bedecked crown is a bundt cake. The recipe, which appears at http://gesine.com, sounds worth a try. She says that the cheese, being on the dry side, adds flavor without a gooey texture. As someone who enjoys the pairing of apple pie and cheddar, I’ve bookmarked it. Oooh, this reminds me of apple cheddar and bacon Dutch pancakes I had in Amsterdam last year. drools Those were so good.